"I don't know what happened. Felipe was slow coming out of the corner. So... It's very difficult to judge"
"I don't think I need to speak anything about that. He passed me." Well, we had a final resurgence from Ferrari again after such a long time. Sadly the conditions were not quite brilliant. It seemed that Ferrari gave their drivers a clear team order. While Masa was leading, he received a radio message from his engineer that Alonso was faster. Shortly after that, Alonso overtook and took the lead to the end of the race. "Fernando is faster than you. Can you confirm you understood that message?" From a team's point of view, it makes a lot of sense. Masa was slowing down a bit and pushing Alonso into Vettel in third. If they kept it up, it could have gone two ways. 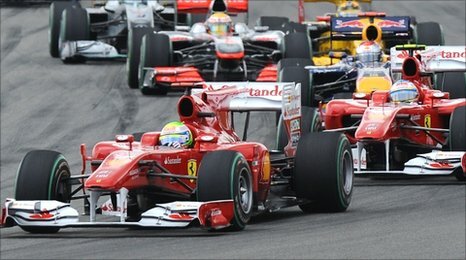 Either Alonso will be so held up he would have ended up behind Vettel. On the other hand, they could have pushed forwards a bit more and kept the Masa-Alonso one-two finish. Still, the decision taken during the race saw Masa fall to second. The eventual interview with the Ferrari Team Principle was quite clear. He was holding back information. Masa was also quite clear that he wasn't happy and wasn't really trying hide what people already knew. Alonso did his best to lie during the press conference, but nothing much at that point could stop the chatter in the world of Formula 1. "39.1 Team orders which interfere with a race result are prohibited." That wasn't really a team order, purely by the message. But anyways, the result was quite clear to us all. However, Michael Schumacher made a relatively neutral and realistic comment that the point of the race is to win the championship. The team has to do what they think is right for them to achieve that goal. Was it necessary though, half way through the championship? UPDATE 19:13 CET: Ferrari has been fined $100 000 for breaching the F1 Sporting Regulations. The results form today's race stands but the incident is now referred to the World Motorsport Council so further actions could still be taken. The intention of the comments from Smedley were clearly instructions and the stewards have various sensible routes of reaching that conclusion - if they get to the point of looking at it, obviously.